"On the 5th and 6th of July 2005, revolutionary comrades and sympathizers of the people's war in Peru, moved the masses that had gathered to protest against the visit of the genocidal Yankee Bush. Hoisting the red banners with the hammer and sickle, the comrades shouted slogans like "Yankee Go Home! ", "Crush imperialism with people's war!" and "Long live the people's war in Peru!". A leaflet by the Maoist Study Circle was distributed among the masses." 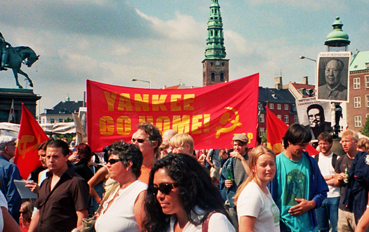 12.000 demonstrated yesterday against Bush in the middle of Copenhagen. The far left wing was in majority. The party is already over, and the central character has gone to Scotland, when a demonstration takes place Wednesday afternoon against president Bush on Christiansborgs Slotsplads [the square in front of the parliament building in Copenhagen, - transl.]. Still, close to 12.000 people have shown up. The place in front of Denmark’s centre of power is, for a couple of hours, filled with tie-dye shirts, singing and red banners. Lots of red banners.